Down the Road is on hiatus, returning Monday, 26 September. I’m rerunning old posts in the meantime. Here’s one of my oldest camera reviews, from 2008, when I was just learning photography. 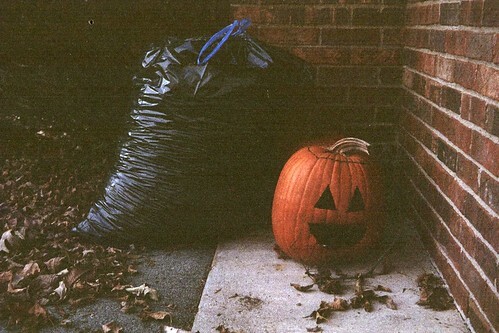 I had so much fun taking photos with my Kodak Retina Ia that I figured this Retinette IA would be a hoot too. Boy, was I wrong. 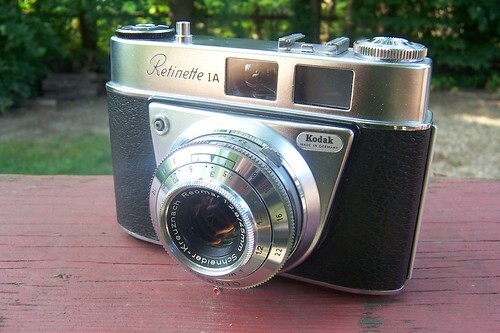 I’m sure this Retinette was a very nice camera in its day. It cost $45, which was way more expensive than an average Brownie but probably quite a bargain for its fine German lens and brick-outhouse build quality. Retinette IAs come with three or four different shutters and two or three different lenses, but mine’s got a Pronto shutter and a 45mm Schneider-Kreuznach Reomar lens at f/2.8. That, and the fact that it has a cold (rather than a hot) accessory shoe, says it was made in 1962 or 1963. I have written before about the perils of buying old cameras on eBay, and I learned as soon as I put my eye to the viewfinder that I fell into one of them with this camera. One of the pieces of glass inside the viewfinder had worked its way loose – maybe it happened in shipping, or maybe the seller just neglected to mention it in the listing. Whatever, the glass’s funky angle blurred the view – instant myopia! – making framing shots difficult. I have written before about the perils of using a camera without reading the manual first. I took a bunch of shots before I realized that the camera’s focus scale is in meters, not feet. At least those shots looked exactly like they did through the viewfinder. I have not written (but believe me, I have stories to tell) about the perils of old-camera mechanical problems related to age and disuse. I was able to shoot only 11 photos before the film jammed in the camera. I was able to rewind the film, and so I did, and so I called this experiment a failure. I chose to shoot with my Retinette IA this time because blogger Kristarella had so much good luck shooting with hers. Maybe she used up all the Retinette karma. Maybe I just had a bad few days with this camera. Either way, I’m glad I read her blog first or I would probably have succumbed to the same problem with the camera’s self-timer that she did. 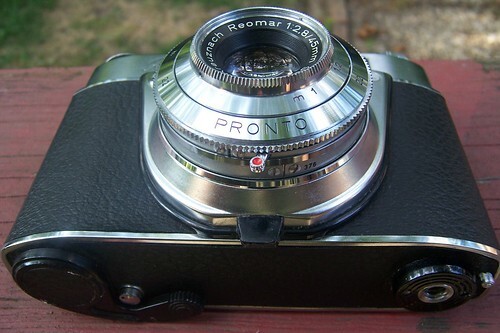 Anyway, this one’s back up on the shelf for now, awaiting the day I am up to fixing the viewfinder and winder. I should probably download a manual that day, too. Feeling like I had fallen off my bicycle, however, I immediately got one of my old rangefinders off the shelf, a Minolta Hi-Matic 7, and loaded her with some Fujicolor 200. I had much better luck with her, and I’ll share those photos soon. Do you like old cameras? Then check out all of my reviews!